Director – Joseph Sargent, Screenplay – Rod Serling, Based on the Novel by Irving Wallace, Producer – Lee Rich, Photography – Edward C. Rosson, Music – Jerry Goldsmith, Art Direction – James C. Hulsey. Production Company – ABC. When the US President and most of the Cabinet are killed in a plane crash over Frankfurt, the nearest successor in line to the presidency is Senator Douglas Dillman. However, Dillman is a Black man and the notion of a Black president causes an uproar. Dillman steps up to the job but soon realises that those around him are only thinking him of as an interim caretaker until the next election. He determines to prove his worth. His opponents decide to give him enough rope to hang himself. When Dillman impetuously rushes to defend an African-American student from the charge of assassinating the South African Minister of Defence, this becomes a highly contentious issue that his opponents seek to turn into his undoing. The Man originally started out life as a made-for-tv movie but was deemed to have sufficient quality that it was instead released cinematically. In that The Man contains what at the time was a speculative scenario – an African-American man becomes the President of the USA (something that did not come to pass until the election of Barack Obama in 2008, thirty-six years later) – therefore must count as borderline science-fiction. The Man features a script from Rod Serling, the creator/host of tv’s classic The Twilight Zone (1959-63). In the decade since The Twilight Zone ended, Serling began to turn to bold, politically charged screenplays with the likes of Seven Days in May (1964) – another speculative quasi-science-fictional scenario set around the US Presidency – Planet of the Apes (1968) and the racial drama tv movie A Storm in Summer (1970). The downside of Rod Serling’s writing was that it could often descend to the shrilly moralistic, dealing in caricatures and melodramatic hyperbole, as in the Night Gallery tv series (1969-72), which represented Serling at his worst. On the other hand, when he did work at full strength, as he does here, it was good to see Serling return to the level of literacy that won him a Peabody Award and three Emmy’s back in the 1950s for the writing of tv plays like Patterns (1956) and Requiem for a Heavyweight (1957). The Man is a fine film. Rod Serling adapts a 1964 book by Irving Wallace, author of The Prize (1962) and The Book of Lists (1977), and delivers a strong and literate screenplay. The politics and humanism come to a surprising level of eloquence. The scene as James Earl Jones stands up to decry assassination at the end – “You cannot kill a dream by killing the dreamer, all you commit is murder” – is moving. 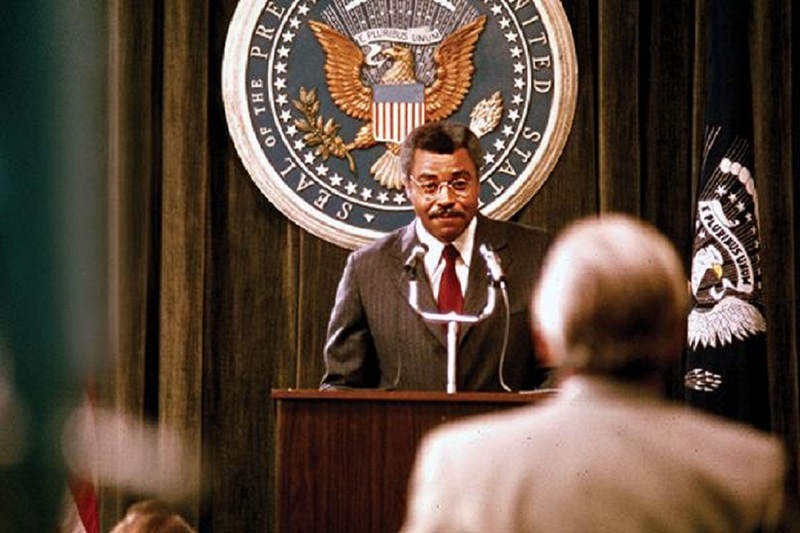 The production is topped by James Earl Jones who gives an impressively noble and commanding performance of both compassion and weakness but above all of moral fibre. He is given able support, especially from the great Burgess Meredith. Joseph Sargent was a veteran director of films and tv. His most famous film is probably the original version of the thriller The Taking of Pelham One Two Three (1974). He made a surprising number of works that fall within genre guidelines including One Spy Too Many (1966) and The Spy in the Green Hat (1966), both films patched together from episodes of The Man from U.N.C.L.E. ; the computer takeover film Colossus: The Forbin Project (1969); the pilot for the tv series The Immortal (1969), with Christopher George as a man whose blood contains a universal panacea and the secret of immortality; the tv movie The Night That Panicked America (1975) about the panic that ensued over the true life Orson Welles War of the Worlds radio broadcast; Goldengirl (1979) about an attempt to genetically engineer an Olympic super-athlete; the tv movie Tomorrow’s Children (1982) about test-tube babies; the horror anthology Nightmares (1983); and the mini-series Space (1985), a fictionalisation of the Space Program; and the notorious Jaws: The Revenge (1987).